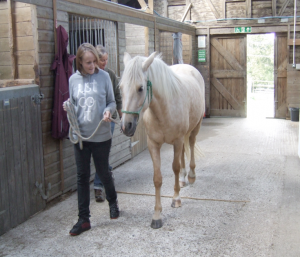 Seeing them struggle to come to terms with life events support workers asked them if they would be interested in attending Bodster Equine Therapy and work with the staff there and horses to overcome some of the feelings they were experiencing. At first they were not sure but took some time to read the leaflet and ask some questions and then make a trip out to see the location and meet Jo and Giles who run the centre. This visit was a relaxed informal chat and convinced them to take part and enter into a 5 week program. Jo is very clear on objectives and committed to what the customer wants to achieve in their own time. She said “Our aim is to raise aspirations and ambition and to nurture skills and attributes needed for personal fulfilment and to make a positive contribution to the community and society, through students working with horses”. They have thoroughly enjoyed this new venture- at first Steph was not sure as she had never been around or close to horses her partner had spent time with horses in the past and was more at ease around them. We would love to be able to run further courses with Bodster. Jo will tell you that horses have developed excellent awareness of non-verbal communication because this is the main way that they communicate with each other. They hardly ever use verbal signals. Working with a horse gives people the opportunity to overcome fear and develop confidence. It also provides opportunities to discuss other intimidating and challenging issues. If you would like to know more you can check out the web page at www.eaqbodster.co.uk.